MusicMedic.com is the industry leader in hot air padding technology, and has won over many skeptical technicians. Many years ago, we realized that there had to be a better way than using flames in the shop and we created the Vortex Air Torch™. Hot air is safer, faster, and easier to use. 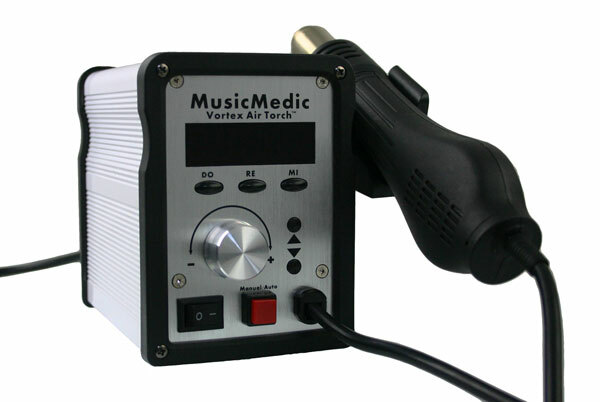 The Vortex Air Torch™ from MusicMedic.com is designed to decreased padding time while eliminating burnt materials such as felt, cork and lacquer. With 0-500 degree celsius temperature control as well as an air velocity controller, the Vortex Air Torch™ allows a technician to decide the exact temperature and velocity of air that touches the instrument. MusicMedic is the industry leader in hot air padding technology, and has won over many skeptical technicians. Many years ago, we realized that there had to be a better way than using flames in the shop and we created the Vortex Air Torch™. Hot air is safer, faster, and easier to use. The Vortex Air Torch™ from MusicMedic is designed to decrease padding time on all woodwind instruments, while eliminating burnt materials such as felt, cork, and lacquer. With 0-500 degree celsius temperature control as well as an air velocity controller, the Vortex Air Torch™ allows a technician to decide the exact temperature and velocity of air that touches the instrument. As technology continues to improve, so has the Vortex Air Torch™! MusicMedic's founder Curt Altarac travelled directly to the factory to make some changes. The result is a custom Air Torch™ which is entirely unique to us due to its upgraded components. The new and improved Vortex Air Torch™ has an attractive and sleek aluminum housing, but the biggest improvements are what's inside! The upgraded double-sided circuit board is custom designed and is far more durable and long lasting. The improved circuit board reduces the workload on the heating element so that it will last for much longer as well. The On/Off switch is upgraded with a sturdy switch. Setting the airflow and air temperature is now faster than ever! The air temperature and air speed are displayed via a digital screen. You can now program 3 custom temperature and airflow settings with our “Do”, “Re”, and “Mi” buttons. Another great new feature is when you take the torch handle from the holster, a blue light blinks to indicate that the torch is heating up. Normally, when you place the torch back in the holster, it begins to cool down. If desired, you can select the Manual override button, which disables the auto shut-off feature so you can continue to use the torch while it is stationary. The two meter long cord is a fire retardant silicon based cord that won't melt. Just like all of our electronics, we offer 1 year repair or replacement warranty on the Vortex Air Torch™, and we offer reasonable in-house repair service. Available in 110 volt version for the USA and a 220 volt version for Europe and Asia. The Vortex Air Torch Replacement Tips - replace just the heat resistant silicone tips, get an entire metal tip for more choice of sizes or to replace a missing part. This torch holder will hold larger torch heads up off the bench and put the flame where you need it. Screw the torch holder into the bench and rest the torch handle in the cradle.